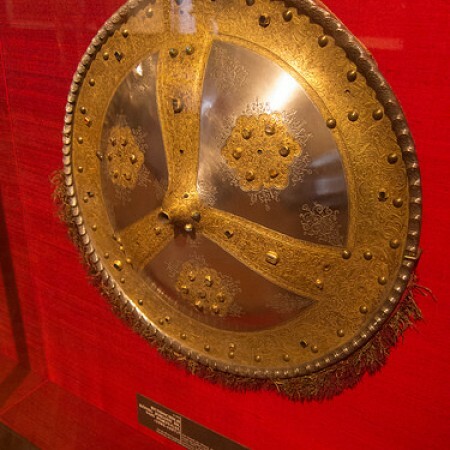 A shield is meant to stop the blows of a sword or projectiles like arrows, darts, javelins and spears. The shield of faith stops the devil’s fiery darts. A shield is meant to stop the blows of a sword or projectiles like arrows, darts, javelins and spears. It is a soldier’s first line of defense against incoming threats. Shields were attached to the opposing or weaker arm. The primary arm held a sword or spear in order to attack. The shield could be quite large depending on what kind of defense was necessary. A combination of defense with the shield and attack with the sword is done when both arms worked together. The shield of faith for the Christian is his primary defensive weapon. It is held in the opposing arm. The strongest arm always holds the Bible. Faith is the shield the Christian must use to defend against attacks of the heart and mind by the devil’s fiery darts. We must have faith that God can deliver us. We must believe that He is nearby to put His love and charity in our heart when we need it. We need to have faith that He will not tempt us above what we are able. We need to call on Him in faith when we are in trouble. Faith is our defense against the devil’s fiery darts. At the same time we need to fight back with the sword of the spirit or Bible in the other hand. We need to use both in combination as a soldier would. You can’t really have one without the other. Faith has a quenching or extinguishing effect. The devil does not just use regular darts against us. He is using flaming arrows. The flaming arrow did the most damage when it flew into a thatched roof in the camp undetected. Before you knew it, the whole fort was on fire. Such it is with the devil. He gets us distracted and then fires a flaming arrow somewhere we least expect it. It then starts a blazing fire in our lives that we could never put out in the flesh. The only defense left is to call in the four alarm fire to the heavenly fire house. By faith we need to have the Lord put out the fire started by the devil. Faith is a necessary defensive piece of armor in the Christian’s Arsenal. We need to trust the Lord by faith that He always has our best interest at heart. He is a Heavenly Father and we are his sons and daughters by faith. Faith is the substance of what we hope for. We can see the evidence or results of it everyday in our life if we look for it. The Lord cares for you. This post has been seen 1641 times.